How Germany's weather team views the "hottest year ever" | Watts Up With That? Everybody is talking about global warming – but in Germany and also in many other countries around the world people are currently fighting with the adversities of extreme cold. And indeed: “The year 2010 will be the coldest for ten years in Germany,” said Thomas Globig from the weather service Meteo Media talking to wetter.info . And it might even get worse: “It is quite possible that we are at the beginning of a Little Ice Age,” the meteorologist said. Even the Arctic ice could spread further to the south. It is already clear: the average temperatures in Germany this year (8.1 degrees Celsius) were 0.2 degrees below the long term measured average of 8.3 degrees. “I fear we will end up still significantly lower by the end of the year”, said Globig. The long-term average is actually the average of all German stations from 1961 to 1990. In Berlin, there was an absolute cold record in early December, “For 100 years it had not been as cold as in the first decade of December,” said Globig. This also applied to other regions. But why is it so cold just now? Might it have anything to do with climate change? “I’m very sceptical”, replied Globig. A few years ago when we had a period of mild winters many climate scientists warned that winter sport in Germany’s low mountain ranges would soon no longer be possible anymore because of global warming. “Now they are saying: the cold winters are a consequence of global warming – a questionable implication,” according to Globig. Then followed a period of milder years, and, probably the impression spread that there will be no more real winters in Germany”, said Globig. “That was a misjudgment.” People became careless, and as a result the authorities run out of grit in a very short time last winter and this year the airport operators lacked de-icing fluid for airplanes. In the Berlin the S-Bahn traffic came to a halt because of the cold and the high-speed trains did not run either. “Our modern, high-tech world was completely overwhelmed with the winter situation” said Globig. Many had succumbed to the delusion that the usually mild winters of the past ten years would continue. But already the winter 2009/2010 – with its long periods of frost and snow well into spring – was an eye-opening event for many. “This eye-opening experience could be even bigger this year,” predicts Globig. Globig sees two main causes for the significant cooling: First, the cyclical changes in the big air currents over the Atlantic, and second, the variations in solar activity. “Both pressure areas do not exist right now,” explains Globig. On the contrary, over the Azores there is lower air pressure and a high over Iceland. “The weather over the Atlantic is upside down,” said Globig. Now cold air from the polar region has lots of space to flow to Europe – and that is what is happening. “These changes in the so-called ‘Atlantic Oscillation’ are totally normal – just hard to predict in detail,” explains Globig. The storm “Kyrill” in 2007 was the peak of the flow activity from the Atlantic to Europe. “Since then it has grown quiet over the sea,” the meteorologist said. The lows over the Atlantic have become weaker and weaker. This effect has taken place in previous years, but at irregular intervals. Science does not yet know much about it, says Globig, „but here lies the key to a better understanding of the seasons”. This is also supported by the current development of solar activity. Solar activity has passed the zenith of a nearly 200 years continuing phase of high activity and will decline in coming decades. Around the years 2040/2050, scientists expect a new so-called solar minimum, with very little supply of solar energy into the Earth’s atmosphere. Spread of the Arctic ice? “I think it is even conceivable that the Arctic ice spreads significantly in the years to come,” said Globig. The impact of solar activity on climate has been criminally underestimated for a long time. Unfortunately the communications between such as this meteorologist and the dangerous people of like mind who populate the CAGW annual UN climate meetings are non-existent. Watch now for a German meteorologist or climate scientist to neutralize Globig’s views. Germany is loaded with these cats. I think it is interesting to note what is happening in Iqualuit, Nunavut, Canada; near the Arctic circle. For yesterday, the average high temperature was -18 C. The actual high temperature was +3 C; 21 Celsius degrees above normal. If this had occurred today here in Ottawa, Canada, we would have had the equivalent of a nice cool summer day, instead of temparatures hovering around 0 C.
Even mainstream TV weather forecasters are being interviewed with increasing frequency and are beginning to talk about natural climate variability. A year or two back it was ‘Folgen des Klimawandels’ and ‘Klimaerwärmung’. Now the tone is more questioning with the certainties of the past now longer paraded with the same ‘settled science’ triumphalism. Latif’s ( IFM-GEOMAR Kiel) comments about no discernable warming since the 90’s because of natural variability masking AGW (which he said surprised him) broke, so to speak, the ice here in the main stream media. All in all, a lot of hedging going on. Oh, please. Not the dreaded “very little supply” forecast. It must then be an order of magnitude worse than this article says, with the UHI and warm-earther “adjustments” to the record. Maybe a Maunder minimum is at hand? > 35 C , so Mr Hansen you better get to quoting those figures MATE! If this isn’t proof that these quacks don’t know their rears from a whole in the ground, nothing is……………………….. Yes, that is absolutely true. If solar activity will not start to pick up, LIA 2 is here within few years. There has been a snowstorm in Río Gallegos, Santa Cruz province in Patagonia, two days ago with only a week away from the official entrance into SH summer. In Februrary 14th, 2007 was also a great snowfall in Bariloche, a ski resort in Patagonia, allowing tourists to put on their skis and have some fun in the slopes. The day before tourists had been swimming in Lake Nahel Huapi at the bottom of the slopes. Cold polar fronts are constantly bringing cold air to Argentina, a country presently going through a severe drought induced by the well settled La Niña in the Pacific. These conditions will last until mid March. please visit wetter24.de http://tinyurl.com/2bhpabr to see a map of the temperature deviations for December in Germany. The temperatures differ up to 5°C below the average values. It is a harsh winter indeed. “The impact of solar activity on climate has been criminally underestimated for a long time.” Doesn’t sound like consensus- building in Germany. This event would signify extreme cooling, at least in the Northern Hemisphere. Many deaths would results in Europe and North America as a result, which would be tragic. However, I fear seeing Arctic ice increase will be the only way to empirically, once and for all, with decisiveness, kill CAGW theory. No doubt there will still be a handful of True Believers who cling to the CAGW religion. But, with a doomed-arctic-ice meme dead, the Warmers won’t have much to hang their hat on, from either a science standpoint, or a propaganda standpoint. Is this not exactly what Dr Zangari proposed back in June 2010, when he considered that the tentative gulf stream would be stopped by the spilled oil from Florida’s gulf coast. His estimate was 10 degree lower temperatures than the norm. Even though his paper is just speculation, maybe there is something in what he has said, at least in regard to the current when it should becomes the North Atlantic drift. Well, at least the French would be hilariously happy if Germany froze over for a while, or two, so they could get the EU subsides for the german farmers as well, which is surly need by the french farmers since they only get like 50% of the total EU budget now. But OMG, will the beer in Munich in October freeze then? It means it’s worse than we thought! Billions will DIE!!! Don’t panic! No, no! I mean Don’t Stop Panicking! Unless I’m very much mistake there was not nearly enough oil released to do anything of the sort. The entire oil-induced gulf stream collapse idea was based on models (there’s that word again) that vastly overstated the amount of released oil and then assumed the worst possible effects. No, once again this is simply natural variability, over which man has not had a jot of control. That’s an interesting article. I don’t want to over-interpret the results for a single country, but it’s necessary to keep all of the individual cases in mind when talking about overall trends. One thing that was gotten wrong, though, was an apparent confusion of the terminology with the regular solar cycle of maximum & minimum with the rarer and longer-term Maunder and Dalton Minima. For instance, “…since the second-to-last solar minimum, many hundreds of years ago.” But maybe that’s an issue with the translation. 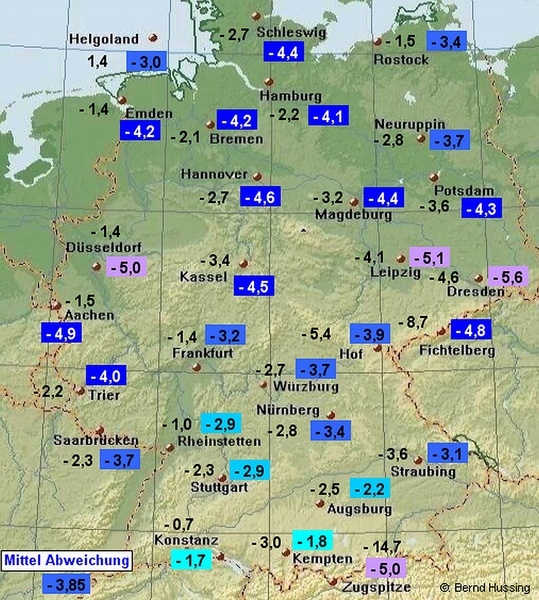 Even though snow came 3 weeks earlier than last year, last winter was also extremely cold here in Germany – so my question would be how the Macondo spill in April 2010 managed to give us a cold winter in 2009/2010. Wow, the sun’s supply of solar energy is going to slow to almost a trickle during a “new so-called solar minimum” in the years 2040/2050? Is this the height of ignorant writing or what? I will kind a guess the author simply wasn’t aware of the less than 1% variance in TSI between solar max and minimum means that during a solar minimum the earth is still receiving 99% of the “supply of solar energy” (and thank god it does, or we’d be back to the ice house earth of 700 million years ago. I actually expect to see more and more of this kind of inaccurate and rather sensationalist reporting going on over the next few years as populated areas of the N. Hemisphere continue to suffer from very cold outbreaks during the next several winters. This is no different than some of the ignorant reporting that has gone on with the “warmist” side of the camp. What we are not seeing is a general cooling of the N. Hemisphere at all, nor are we seeing growth in year-to-year Arctic sea ice as this article ignorantly seems to hint at, and we certainly aren’t in danger of seeing the earth having “very little supply of solar energy into the earth’s atmosphere.” DMI temps for the arctic are actually above normal right now, as might be expected with the higher than normal pressure over the arctic regions that is forcing all the cold air south. You can conduct your own experiment to see exactly what is happening. Simply stand by your closed freezer door and record the temperature every 10 seconds for 10 minutes (it should be fairly constant), and then quickly open your freezer door and record the immediate temperature inside the freezer and then in the same relative location where you were previously recording it outside the freezer door, except now the door is open and the cold air is pouring across your thermometer. Guess what? The temps on your thermometer should be falling. Record those temps every 10 seconds for 10 minutes and then at the very end, before you close your freezer door, take the temperature once more inside the freezer. It will either be the same or more likely slightly higher as there was only a certain volume of cold air in the freezer and it has now mostly be evacuated. This is similar to what is going on with the Arctic and some regions of the N. Hemisphere right now. The freezer door is open. The only difference is that the Arctic is constantly recharging its supply of cold air (at least during the dark winter months) and your freezer can’t do that in the same manner. What has happened in the past 2 winters to open the freezer door is that we’ve seen a shift in atmospheric pressure that has spanned both the last El Nino and La Nino cycles of ENSO…i.e. you can’t blame the current La Nina for the negative AO of last winter. This pressure shift has made the outbreak of cold air to regions further south more likely and also has coincided (or been reflected in?) a period of more frequent Arctic Dipole Anomalies. Some scientists are blaming lower sea ice for this, but I have a feeling it is more complicated than that (but still likley related to AGW), but the net result is that the cold air that normally stays north isn’t being trapped up there. Probably not as cold as 2014 to 2020 will be. Without being overly dramatic, there is a pernicious side to the alarmist mantra about warming, in the sense that it is leading to people being a less prepared for the cold that still occurs – whether you believe in AGW or not. 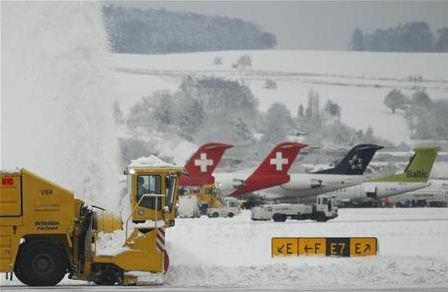 As the story indicates, the Berlin airport “lacked deicing fluid” and that people become careless or complacent about cold weather they think is a thing of the past. It was not a thing of the past for several hundred drivers in Ontario this past week. what is the efficiency of all these solar cells buried under snow and ice ? I’ve already seen the NSIDC Arctic Sea Ice Extent on your page. The ice sheet coming from Greenland is almost touching the Iceland! Incredible! Stop spreading this garbage. The oil was NOT “spilled from Florida’s gulf coast”. The oil spill was south of New Orleans, some oil made its way to the panhandle area of Florida which is in the north part of the Gulf of Mexico. Please look at a map. No oil, none, nada, zilch went anywhere near the rest of Florida’s coastline. No oil made its way around the southern tip of Florida and into the Gulf Stream. No oil appeared anywhere on the east coast of Florida or in the Bahamas. None, nada, zilch! Finito! Here in Australia there is December snow, and the longest and coldest winter for a long time where I live. We are supposed to be having summer now. You might keep in mind that it is a machine translation and the fine nuance of the statements may be distorted. I do think the fact that 4 out of the last 5 solar maximums being in the top 10 of solar cycles is seriously underestimated. I also find it odd that folks are convinced that a “less than 1% variance in TSI between solar max and minimum” of the most powerful thing in the solar system has no effect on the earths climate, yet a change of .0001 in the composition of the atmosphere over 150 years has a major impact. This cold spell is all part of the Global Warming due to anthropogenic CO2 emissions. What is wrong with the Deniers? Can they not see this obvious fact? Please consider freezing to death this Christmas to save the planet. Fighting words which support the proposition that CO2 has low climate sensitivity. As records are set all over Europe, this is my favourite. In 1976 the UK got its first stand alone covered shopping mall in Brent Cross, north London. Today, for the first time in its 34 year history, it had to close due to the snow. Meanwhile, we’ve got incredible high pressure dominating the Arctic as the AO index is of course quite negative. Lower than normal (and has been since 2004) Arctic Sea Ice, higher than normal atmospheric pressure over the Arctic, colder than normal winter in Europe…could they all be related? Likely. I’ve no doubt that the sun influences the climate– how could it not? Just as I’ve no doubt that the composition of the earth’s atmosphere also is a great influencer of climate. The issue is whether a 1% variance in TSI (at the most) from solar max to minimum along with secondary effects that may be produced by the variances in galactic cosmic rays is all of a greater influence than a 40% rise in CO2 over a few centuries. For many the issue is settled, for others, the jury is still out…and hence, why WUWT can be so much fun! Since the Arctic is warmer, it presumably is radiating more heat away. This looks like a negative feedback, but I have no handle on the quantum. But prima facie it could be that the warmth of the last few years is being dumped. Whether this compensates or overmasters the additional heat absorbed due ice loss, I don’t know. But do the models properly allow for such matters, I wonder. Separately, what looks true is that the political equation is changing, with more and more voters regarding AGW as a busted flush. Politicians will follow, eventually, see USA. R. Gates misses a major point. And that is the fact that meteorologists in Germany are no more afraid of spelling out the fact that it’s not getting warmer anytime soon. It does matter little whether this particular meteorologist is right about a coming ice age. What matters is that the complete absence of discussion in Germany is crumbling now. Yes, there was for years not the slightest doubt about AGW in all of the German media. The US was generally characterized as lunatics for not joining Kyoto – how could they, jeopardizing the entire planet. This warmist stranglehold went through all media, state controlled as well as private, and through all parties, culminating in the role of “Climate Chancellor” Merkel, resulting in vast amounts of money down the sink hole of wind and PV subsidies. Climategate was never reported by our media; well, maybe in a by-sentence. Even during the last harsh winter no doubt in the cult of AGW mitigation surfaced. A whole lotta BBC’s if you will. And that is all falling apart now. Yes Tom, you are right. We are still seeing this misstatement of fact when it comes to the Macondo Oil well spill of this past Spring and Summer. For some reason, far too many people still associate this tragedy with Florida when in fact it happened just off the coast of Louisiana. And you are also correct in stating that only the far western-most beaches of the Florida panhandle saw any washed up crude oil at all, the rest of the state was and still is completely oil-free. Additionally, the hypothesis which some have put forth and which suggests that the crude oil may have disrupted the Gulf Stream current is also highly far-fetched. In fact, both the undersea spilled oil and the Corexit® dispersant that was used by BP to break down the crude oil got nowhere near the Loop Current in the Gulf. Early satellite images, in early May of 2010 showed some evidence that a small part of the surface oil slick may have drifted far enough south to have interacted with the current but there is a big difference between a slick on the surface and undersea plumes of oil and chemical dispersant. The two phenomena act entirely different in conjunction with sea currents and other factors in nature. And the hypothesis relating to disruption of the sea currents is related to undersea oil and dispersant, not any residual oil on the surface. Regardless of all of this, none of the crude oil or dispersant ever showed up anywhere outside of the Central Gulf Coast within about 250 kilometers of the spill in spite of early predictions to the contrary. BBC News just reported the coldest day in Northern Ireland since records began. Not often do I agree with R Gates, but it does happen from time to time. I think I would have put it more mildly, though, and satisfied myself with simply quoting the IPCC on solar irradiation variance. R Gates again – and me agreeing again : “The issue is whether a 1% variance in TSI […] a greater influence than a 40% rise in CO2 […] WUWT can be so much fun!“. I would just add that secondary effects might not be limited to galactic cosmic rays only – we just don’t know. Clearly such disastrous cooling will require a massive transer of wealth from rich countries to poor countries to mitigate its effects. In other words, not to worry folks –doesn’t matter how the problem changes, the solution will always turn out to be the same. . .
Not too dissimilar to your own post where you quote the 40% increase number, but not the fact that it’s logarithmic. All I said in my quoted paragraph immediately above is that there was a high-pressures sytem over St. Louis, which happened to experience 90 days above 90 degrees. In other words, it is a simple report of fact that says nothing about what might have caused this event or high likely the event might be in the future. As a matter of fact, the event has not re-occurred in 30 years and there is no noticeable heating of the environment of St. Louis. You write as if the causes of the European cold are just about to reveal themselves as AGW. Yet you actually say just what I say, namely, that there are these temperatures and these pressure conditions, which might be unusual. Would you please stop your fiendish habit of propagandizing for the AGW cause by dressing plain factual statements in the garments of the latest starlet, Angelina Jolie or whoever it might be? Sir, you are gushing! Restrain yourself. Otherwise, I highly recommend that Anthony ban you. I have lived in Germany in Hanover in the early 90’s. I remember really cold snow rich winters, where the snow would be around forever on the streets getting ever blacker, that were unknown to me from my home country, the Netherlands. Still, this only demonstrates that as long as weather is not global, there is no point in discussing global climate or the change or “disruption” thereof; what on earth could this possibly mean? I read the original. From the context it appears that it was not Thomas Globig who talked about “very little supply of solar energy” – because then, i would expect it to be in quotes, like they do when they quote him. 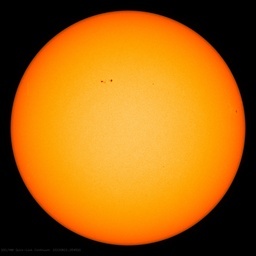 Around 2040/2050 scientists (they don’t say which) expect a new so-called solar minimum (well, we have one every 11 years, so this must have been written by a journalist) , meaning very little supply of solar energy into the Earth’s atmosphere (come on – no meteorologist would phrase it that way). So my hunch is that he is not a climate specialist but just a journalist doing all kinds of jobs. Peisner’s getting lame.. I had this up a day earlier already, and you were tipped. Okay, he added a few anecdotes here and there. I’m watching you now Peisner. Watch yout step, bro. You’re getting an e-mail tomorrow, Peisner. This is the sort of truth that is designed to mislead. The fact is that 100% of the sun’s energy is needed to maintain the earth at about 288K. If the sun’s output drops by 1%, all other things being equal, the temperature will drop by about 1K. Since this is more than the increase in the last century it is not to be ignored. Moreover all things are not equal. We know that during these periods of low overall output the sun’s short wave radiation drops by far more. The solar wind also drops and all sorts of feedbacks are possible given these changes. If the AGWarmers are allowed to conjure up as yet unproven positive feedback mechanisms to amplify the 0.7K warming for a doubling of CO2 why can’t the sun worshippers do the same. Personally I cannot get excited about any of this. Until someone comes up with some real data I am going to remain sceptical of both sides of the argument. This is the ‘money shot’ for me (my emphasis). The obvious difference is that the Sun has 330,000 times the mass of the Earth and 1% of its output has real significance, while the amount of CO2 in the atmosphere is infinitesimally small. Think of it this way – my water has 1 ppb of arsenic, but later on it tests at 4 ppb. It has had a 400% increase – but it is still insignificant in any real sense. In the case of CO2 you are worrying about the minuscule impact of humans (4% per year) of an incredibly small portion of the atmosphere that has been much higher for the vast history of the planet, but since it is such a useful substance (to life) it has slowly been sequestered out through various biological processes. My personal belief is that if nothing had come along to release these fossil fuels (like us) then the planet may very well have faced a massive extinction from the lack of plant growth. I think that those who are complaining about the phrase used in that article, “with very little supply of solar energy into the earth’s atmosphere” are missing something that should be rather obvious. The problem is not likely due to ignorance on the part of the scientist or original author of the article but rather in the translation from German to English. Translating from one language to another is a very tricky thing and that is one reason why computer translation programs are notoriously poor. In this case, it was an individual who was doing the translating but almost certainly this person is more proficient in one of the two languages than the other. Very often when translating an article, one must reconstruct entire sentences in order to attempt to capture something close to the intended meaning of the original author. This is in part because certain words and phrases which exist in one language do not exist in the other or because common idioms are used for an expression in one language but would mean something entirely different if translated word for word from one language to the other. Instead of using “very little supply of solar energy” the translator perhaps should have used “significantly less solar energy” or perhaps “much reduced solar energy” or something similar. Remember that to scientists, any change in the level of solar energy output is considered to be significant. So in attempting to highlight the significance of reduced solar energy output, the German author may have used words which German-speaking readers would understand far differently than English-speaking readers would. In any case, I think the problem there is with the translation and not with the intellect of the scientist involved. I seem to recall some other phrases in the article which were clumsily translated, such as “the first decade of December, 2010…” My guess is the German author meant either the first one-tenth of the month of December or perhaps the first ten days of the month but in the translated version it did not make sense, in English. ‘Fighting words’??? The alarmist crowd runs away from any fair debate with their tails tucked firmly between their quivering hind legs. ‘Fighting words.’ As if alarmists aren’t all a bunch of cowards. Abraham is still holed up in his ivory tower, scared to death of coming down to face Lord Monckton, who never runs from a fight. Regarding the silly idea that the gulf stream will shut down, that’s about as likely as the jet stream shutting down. Both act according to the 2nd Law and the Constructal Law. They are heat transfer mechanisms. Worrying about them shutting down is a waste of time. The influence of the sun’s activity has been recklessly underestimated for a long time. “I think that those who are complaining about the phrase used in that article, “with very little supply of solar energy into the earth’s atmosphere” are missing something that should be rather obvious. In this case, you are wrong. It is incompetently written to begin with. In diesem Fall liegst Du falsch. Es ist schon im Original schlecht geschrieben. Not me. I predicted last summer that this winter in Philly would be bitter cold but little snow so I cut and split extra wood. Glad I did. My woodstove is nice and warm right now and there’s plenty of wood to last the winter! I’ve seen some good posts from you R Gates but I don’t think this is one of your better ones. You surely must realise that it is far too simplistic to suggest a 40% variance in CO2 must outweigh a 1% variance in TSI purely because the 40% is a far bigger number. This is what your post implies via the juxtaposition of the 2 percentage values (re-read it carefully and think about it). I do agree though that Globig saying “with very little supply of solar energy into the Earth’s atmosphere” is very poorly phrased whether due to translation issues or not. The two thermostat settings of planet Earth as shown by ice cores, geology and many other earth sciences, are shown to be a regular cyclic pulse between bl@@dy cold for long periods and benign for short periods. It can be totally beyond doubt that CO2 has any role in the switching process, and most likely zero effect on our temperature or climate. That being said our flora world wide is thanking us for the extra and the greening is moderating weather conditions on a local basis. The inordinate sums of money thrown at the so called climatologists to prove that climate change is the fault of mankind, would have been more wisely spent on real scientific endeavour to find the cause or causes of the resetting of our thermostat. A few decades and billions of dollars wasted on unreal science. That a few have steadfastly researched areas of real science and results are now contradicting official wisdom is a credit to them for their dedication in the face of scorn. Of late Gaia has been some what unco-operative to the doomsayer cause and the public have noticed. The trickle of contrary news will become a flood, drowning the doomsayers. Anthony’s blog started as a dim light shining in a world caught up in stupidity. Then it became a beacon to gather reality, and now it is a glaring spot light shining on those of ulterior and unscientific bent. So a couple of winthers is enough for a turn of direction? Thats all it takes? Good grief, what a bunch of whimps. Shoot! And I had just finished painting my roof white. In a way this is bad news, not for the sadly broken AGW theory, but for the inhabitants of Earth. If we do continue trending this direction over the coming decades (as historical trends seem to indicate will in fact be the case), there’ll be a run on black paint and asphalt, and talk of potential global warming will be of a nostalgic bent as the chill sets in. Maybe Trenberth will find some of that missing heat to help us out, but he’ll likely be hiding out in his igloo at that point (not that I would expect any assistance from the AGW string-pullers or their activist scientists/unwitting followers). So I’m happy these continued AGW coffin nails are being hammered in, but sad that people will suffer far more drastically than they would have with a continued warming trend. The AGW crowd has harped about AGW food shortages. They ain’t seen nuthin’ yet if we are heading toward Maunder, or even Dalton. Peisner, you’ve become a joke. I prefer to put it more in terms of “AGW fantasy.” Man’s impact takes a microscope to find compared to other drivers and controlling factors. I just went over the the story, Please disregard my previous comments. The story was brought to my attention by Benny himself. Yes, I lose track of things at times. 1 (one) lump of coal, “the good stuff”, makes an ideal Christmas gift for the warmist in your life. It is not the 1% or what ever small TSI variation, it is the much larger variations of the many solar components that is the important factor. TSI is a too simplistic measure of all the various solar components that cause differing climatic effects in their changes of output. At least the German authorities know that grit is needed, even if they aren’t buying enough. Here in Spokane we have a different problem caused by the same basic source. Following orders of the eco-terrorist group “EPA”, the city refuses to use grit until the last desperate minute. Before the eco-terrorist group “EPA” had full control, this city sanded every street generously, with much fewer accidents and deaths, and much less plowing. Now they are forced to use an ineffective de-icer liquid and spend vast amounts of money on plowing. Know what they call climbers who believe that their will not be bad weather? A while ago a group of climbers were caught in a snow storm on Ben Nevis, half dug in and half walked down. The half who bevid down survived the other three were found some 10, 20 and 30 feet from safety. It’s not statistically significant, is it? Just to give an idea of how much fake warming there is, .2 C is enough drop in temperature to give the results of the coldest winters over the last century, and this is a local temperature drop where many locales have “warmed” several degrees in order to increase the average. If AGW/CC/CCC caused the freezing conditions in Europe and North America last year then it is a given that increasing temperatures will cause a Little Ice Age. 1% less in TSI has some effect on the earth temperature. T^4 = 0.99 solve for T = 0.9975. This means 0.9975 of the normal earth temp, should emit 0.99 percent of the energy earth normally radiates to the space. I don’t know 0.75C lower temp has what effect on the climate. Should we ignore this 0.75? Why we don’t see the effect? Because earth is a big pot, it stores lot of energy. I turned off my teapot power, the water in the pot still hot for a quiet long time. You are so correct, bordering on genius. Clearly those climate alarmists in the early ’70s did not yet have the mechanism correct. It is only warming caused by CO2 that will lead to an ice age. What a wonderful theory. For those of you who are easily confused. December snow in Australia means snow on the top of a mountain somewhere. It’s not unusual. Australia is seeing a very wet year relative to the last 15- 20 years of warm and dry conditions that included record drought. At the last glacial maximum, mean sea level was about 120 m lower than it is now. There were fresh water ice sheets >1 km thick over parts of N. America. All that is required to melt this ice is an increase of 0.4 W.m-2 in the solar constant coupled into the ice sheets – over 10,000 years. The Earth’s solar climate budget is ~1365 +/-1 W.m-2. A decrease in the solar constant of 1 W.m-2 caused by the change in ellipticity of the Earth’s orbit from the Milakovitch cycle is sufficient to cause an ice age – over thousands of years. The fluctuations in the sunspot cycle are also of the order 0f 1 W.m-2. Over the last 6 solar cycles, the average increase in solar flux was about 0.3 W.m-2. This is sufficient to account for the observed long term increase in the ocean heat content. The Maunder minimum – 50 years with almost no sunspots – was sufficient to cause the ‘Little Ice Age’. No need to worry about CO2. The last 100 ppm increase in atmospheric concentration has had no effect on climate. Instead, look more closely at the solar energy coupled into the oceans and the way it gets transported and recirculated. There is a region in the equatorial ocean where the sunlight can get trapped in subsurface layers below ~ 50 m for long periods of time. That is where we need to be looking for climate change. that’s because you don’t understand, along with a lot of other people, that the concentration of CO2 relative the other gases in the atmosphere is NOT relevant. In principle if you took away all the others gases and had just CO2 you would still have the same amount of green house warming. BUT there are complicating factors such as other green house gases, most importantly water vapour, AND pressure broadening of green house gas absorption spectra. I just always get a laugh at R Gates and his lack of frontal lobe judgement call…that he is actually taken seriously on here. I mean, really, R, comparing you to this expert meteorologist (Globig), is like comparing apples to….bricks. Yeah yeah….as always some of your points are valid. And yeah yeah I guess I am moving into the argument from authority category a bit, I must admit. But therein lies the rub from YOUR quasi-argument from authority: Just enough knowledge to be dangerous. But you have this delusion of yourself as a higher critic of somebody who is actually AN EXPERT IN THE FIELD and would probably eat you for lunch in an actual debate. I thought this was a fascinating post, even if some of it was LOST IN TRANSLATION, such “lostness” in translation evidenced by your naive quip about what Globig actually said. Finally, the NAO, as he said, is very poorly understood….but very powerful indeed. It was a fascinating post….and certainly not mitigated or lessened by your spray paint graffiti of half-truth additions! I know I am stating the obvious but I find it interesting that the NAO and the AO always seem to work in tandem. Two teleconnections and you have to wonder which one drives the other, or just who/whom is/are driving them both. Answer: The same as all of these windmills under continental ice sheets. Love the German connection. Actually love all the interconnections. Over here in the UK, we’ve got a full hand of thumb-suckers. Crown prince, Chuckles, for starters and, just one amongst many, George MoonbatMan. Both of them born with a spoon in their mouths, differently assayed but spoons nonetheless. Each a Guardinanista, both a fantasist, one a direct descendant of the saxony line the other a relic of the central European Marxist ideology. However negative the Central European anomalies become these guys will happily disregard the sign and push the views that make their days. “For those of you who are easily confused. December snow in Australia means snow on the top of a mountain somewhere. It’s not unusual. As a dose of reality, temperatures in some of our main cities are well below normal for this time of year. I have noticed that R. Gates has been spewing out this “40% increase in CO2” lately as if that was something significant. The 40% increase is just 1.12 molecules of CO2 per 10,000 molecules of all the rest of the stuff. But I guess “40% increase” sounds a whole lot nastier. Let us assume the temperature has gone up by 0.8 C over the last 130 years. A large part of this debate is exactly how much man-made CO2 is to blame for this. I have read estimates that say the effect of man-made CO2 is between 3 and 7 times lower than the IPCC estimates. However let us for argument sake assume that 0.3 C is due to our CO2. So by doing very rough calculations, which can certainly be improved upon, I would estimate that “a 1% variance in TSI” is at least THREE TIMES STRONGER than “a 40% rise in CO2.” Naturally, different assumptions will give a different number. Well, I must admit LT that I don’t catch every single post on every thread here, but this is the first time that I’ve actually seen you try to make a foray into the science. Do you actually know what you are talking about? The mountains in Australia are not tall enough to get snow out of Winter. In my opinion as an Australian, it is very unusual to get snow in summer in Australia outside Tasmania, and the snows of the last two years are more than very unusual. They had Snow in Cooma in January of this year, and Cooma is not on a mountain. Snow fell to 3,000 feet (900 metres) above sea level Monday in parts of New South Wales and Victoria states, Bureau of Meteorology senior forecaster Jane Golding said. “Any time of year, it’s unusual to have snow down that far,” she said. Usually, it’s a time for shorts, t-shirts, and a few gallons of Fosters. This year, however, it’s being coated with snow. Obviously another sign of the world’s rapidly increasing temperatures, a cold front moved across the continent’s Southeast region, dropping five centimeters of the white stuff across the Victorian countryside. That’s roughly two inches of powder in the middle of summer. In the city of Melbourne, where humans have apparently managed to increase the temperature by exhaling more CO2, they received half as much – about 10 millimeters…just a bit over a third of an inch. Ms Golding said summer snow was a rare occurrence in towns such as Cooma. So, I think you are simply an ignorant blowhard. I was amused that my namesake from the UK BoM was snowbound in London and could not get to cancun to report that 2010 was the hootest year on record. Why is it that I have a vision of the weather data collecting stations all having a radiator under them to cook the data to the required result? December so far: 29.3 (avg 30.1) and that’s after 3 days of above average temperatures. Today it’s back under 28 and likely to stay low for some time as nearly the whole of Australia is under cloud cover. so it’s not just a European phenomenon! Bishop Hill published an article about Spanish solar cell owners, generating additonial electricity with Diesel generators and selling that at subsidized prices into the grid. If they hadn’t done this at night, they may be still doing it. Perhaps others are smarter and add only a portion day by day. A solar cell with an auto window type heating wire inserted and connected to the power grid. When snow or ice covered, the heating device melts the cover at the small cost of coal or nuclear generated electricity. The additional power produced by the solar cell – though it may be less than the electricity used for melting – may still be expensively sold with an overall proft. I agree that the juxtaposition of the two percentages might seem that I am implying that purely by the difference in numbers (1% versus 40%) that the larger percentage must have a greater influence. This is absolutely not my intent, as surely a 40% rise or fall in TSI would be far greater an effect on earth’s climate than the 40% rise in CO2. The fact that they both are considered as driver’s of climate (with much discussion as to which might be greater) is my point. The fact that the 1% for TSI vs 40% for CO2 are even close to being equal (in some circles) shows how powerful the small variance in TSI can be, especially when looking at the secondary effects from GCR’s, and other related solar effects such as magnetic field strength of sunspots, etc. Google Bilderberg Global cooling. They knew all along about the cycles and were trying to adjust supply/demand of energy so the coming LIA could be managed – but they couldn’t let on. I have noticed that R. Gates has been spewing out this “40% increase in CO2″ lately as if that was something significant. The 40% increase is just 1.12 molecules of CO2 per 10,000 molecules of all the rest of the stuff. But I guess “40% increase” sounds a whole lot nastier. respiratory acidosis (not a good condition to be in). So looking at percentages is usually better for looking at the onset of potential effects. Here’s another example, suppose I buy a stock for $1.00 a share and it goes to $1.40 and I’ve made a 40% profit. That 40% tells me more than simply saying it went up 4o cents a share, because if my Google stock goes up from $350.00 to $350.40, that’s not too impressive. Precentages are almost always better for indicating trends and dynamics– and if the 40% rise in CO2 in the troposphere in a few hundred years (which is the fact of the matter) sounds “scary” than pershaps that should tell you something, for certainly if the CO2 level of your blood increased 40% in a short period and was continuing to rise, you could be on the verge of something very scary indeed. It’s just so funny to see R.Gates and LazyTeen going ever so much off the rails into “out of touch with reality” land trying desperately to find a way to hang on to their beliefs. Then you can just look out the window all over the world and see way out of the ordinary and even record ever cold and snow events…. Such a stellar example of Cognitive Dissonance. It’s a really really bad idea to tell someone who’s freezing and up to their eyeballs in snow that it’s really a “warm snow”. Just sounds like “Crazy talk”. Wait for the snow to melt, then tell them it wasn’t all that bad. They’ll be feeling warmer then and will not want to admit to having been so non-macho as to think a bit of snow was cold. Oh, and when folks have things like, oh, I don’t know, maybe “records” and “local news papers” that show it really IS unusual to have 100 year snow events in the tropics and snow on the door step of Summer in Australia and Argentina and Brazil and… Don’t try to tell folks that it’s just business as usual. It just makes your credibility hit the dumper and folks think you are just making stuff up with no contact to reality. You’d have better luck with that old standby “it’s just a weather event and weather can have extremes”. Yeah, it’s almost as lame, but at least it sounds plausible. Look, I know it’s tough being on the losing side of Mother Nature. Heck, AlGore getting snowed under in Copenhagen, then a constant string of record cold days in Cancun. Now “record ever” cold and snow popping up in all corners of the world. And when you are a bit hypothermic, well, the brain starts to do funny things. So tell you what… why don’t you go get a nice hot cocoa or coffee, thaw out a little, turn the furnace up a notch (we won’t tell anyone) and think about a different approach. Maybe pointing out that the Gulf Stream is slowed a lot (and blame it on melt water diluting the salinity. The physics is right, even if we don’t actually have the melt water. Most newbies wont know that and you’ll sound much more ‘in touch’) or saying that it’s because we’ve overshot to the hot side and now the system is “ringing” (yeah, complete BS, but it sounds good as folks are familiar with other oscillators ringing). It really would be more interesting if you tightened up your game a notch or two. Honest. I find all this amusing because if you read AR4 and the associated science carefully enough, you start to see the difference between what the science says, and what the various political spins that come out of it SAY the science says. Once you get passed that you have an AHA! moment. Everyone has been asking, where is the warming when it has been right where the science said it should be, and now we’ve got cooling, right where the science says it should be. The science says that during a warming trend, most of the warming happens in the coldest parts of the planet, during the coldest times of the year, and during the coldest part of the day (night). So the screaming meamies holler about warming and everyone expects the equatorial regions to burst into flame at high noon. But year after year its about the same because that’s the hottest part of the planet and the hottest part of the day, and so it changes the LEAST. So little you can hardly measure it. Sure, at night, in winter, at the arctic circle, it is -32 instead of -40. Anyone who noticed the change, ain’t complaining, and that includes the polar bears. But now we gots us a cooling cycle. What does that mean for high noon at the equator. Not much. Almost zippo, can’t even measure it. But colder areas, in winter…that’s where most of the change will be, and all those people who kinda didn’t mind milder winters, particularly when summer highs didn’t seem to be much higher anyway, are not quite so quiet when the frost starts covering the windows. Hansen and buds can adjust all they want, but the science says summer highs don’t change much, the variability will be in winter lows. Even the polar bears are OK with higher winter lows. But when those winter lows start heading downward… People notice, they complain… and if you are watching polar bear populations over time…they are gonna be pretty unhappy too. An update on those Australian major city temperatures. 6:30PM (daylight saving) Sydney time. You have a link, please? Hi Anthony, Sorry for this late post, but yesterday (18th Dec), “our” time, it was my 65th birthday and I was too busy shifting 12″ of powdery snow off my drive in order to let my 2 Jack Russell dogs out for a pee. I know that 12″ of snow in 6 hours is a snip for Inuits, Canutes and other North Americans, but for us here on the NW coast of England it is apocalyptic! The last time snow levels approached this figure, I had just reached my first birthday, so I’ll let your other expert climate bloggers work out what year that winter was. Yours Aye, Bob. just for the image credit: the photo has been taken in Zurich, Switzerland. MeteoSwiss is pretending a warming of +0.2 °C compared to the long time average 1961-1990, the climatological standard normal of the WMO. Is R.Gates one percent figure accurate? If I look at the wikipedia entry on solar variation, there is only about 0.1 percent variation over the 11 year solar cycle. Sorry not a simple link for all, it’s from my OSX dashboard weather widget but I that is served up by weather.com and having a look at Melbourne by itself we see that it is now just under 9C. Whatever happened to wattsupwiththat’s Facebook page? As I read the blog I haven’t been thinking of the blog for a loooong time, and when I looked after it, there had been no postings since July? One should be able to share articles like this at Facebook. The winter of 2008/09 was a little too cold as well, so that’s the third consecutive outstanding cold and snowy winter here in Germay. I am German. Here in Schwerin, the capital of the north-eastern german state of Mecklenburg-Vorpommern, we are whitnessing minus 11 degrees Centigrade at NOON today. Yes – we are freezing our butts off, actually. And yes, this winter truly resembles those of my childhood during the 60’s: Long, cold, harsh and with bucket-loads of snow. Hey, Michael Mann: I want my AGW back! The loss of mild winters will be amply compensated by the loss (or at least reduction) of politically correct left wing agenda dressed up as climate religion. We can dress to compensate for lower temperatures, I personally use my bike all 12 months of the year (in Sweden), but what clothes will protect us from insanity and the rampant self-flagellation which is becoming the norm in absurdistan which we used to think of as the west. What has happened in the past 2 winters to open the freezer door is that we’ve seen a shift in atmospheric pressure that has spanned both the last El Nino and La Nino cycles of ENSO..ie. ….. Some scientists are blaming lower sea ice for this, but I have a feeling it is more complicated that that (but still likely related to AGW),..
CO2 The Mighty Molecule! Not only can his Defies Gravity powers kick in by staying up in the atmosphere for hundreds and thousands of years, now with his Mighty Muscles he can move whole pressure systems around, probably with only one finger. In which direction should we all breathe out in co-ordinated unison to change this weather and bring back global warming? He can dust off his orginal rant against coal production resulting in a new ice age and say ‘I told you so’, business as usual. This is actually a private company doing forecasts, it is in direct competition with the ‘official’ national weather service. O/T But here’s something just for you. I screwed up big time and acted like an idiot. Dr Peiser did nothing wrong. I completely misunderstood the situation and shot off before thinking. You can simply heat up a solar cell by applying a voltage – it works like a diode and warms. This way you can melt the snow, and when it’s gone, use the panel as a generator again. Similar to how you can use the generator in a Wind Turbine as a motor. And this is actually done in some industrial scale solar farms in order to maximize output. But i also found a patent about a solar panel with an extra heater. Maybe this is more efficient – but it would also be more expensive so i don’t know whether it’s economic. Actually, it snowed in the Snowy Mountains on Christmas Eve or Christmas Day about 10 years ago. It is unusual, but it does happen now and then. Brrr, it is 6.9 degrees here in Canberra. Just as well I hadn’t got around to taking the electric blanket off the bed! Normally at this time of the year the daily maxima are high 20s and minima around 18. Still, I confidently predict that it will be stinking hot here in January. On that we can always rely! Thank you for making my point so nicely. When your $1.00 stock went up 40%, you made 40 cents. The same 40 cents you made on the $350 stock was an increase of .11428%. On the other hand if your $350 stock went up 40% you made $140. So whenever I see person quoting percentages, I look carefully at the actual effect in the real world. You also said ” Percentages are almost always better for indicating trends and dynamics”. However they, by themselves, are useless in telling us the real world effects of that trend. Apples and oranges, once again to make your argument scarier. The normal range of blood CO2 is 20-29 mEq/L. So if you were at the lower end a 40% increase would simply put you at the upper end. (20 x.40 = 8). EPA tests indicate that exposure to a 17-30 % concentration of CO2 in the air your breathe will have serious consequences. That means CO2 would have to rise to 170,000 ppm to be dangerous. Once again you should work with real world numbers when trying to determine if a change is good, bad or indifferent. same here in Buenos Aires, Yesterday was 18C max (although day before was 33C!) The increased size of the antartica is producing fronts that tend to reach a bit further north. Ie refer to 1 front reaching equator this winter SH. Neither Antarctica, nor it’s sea ice are increasing in size. There has been a slight increase in the seasonal extent Antarctic sea ice over the past decade or so, but there has also been periods where it has been below the 30 year average during this same period. It would be good to have some accurate data about the Gulf Stream flow since there have been all those scare stories about it slowing or stopping. Do such sites exist with accessible data? Isn’t it obvious at this point that all these proxies don’t have the highest resolution? I believe that Shane and Wyner articulated this with the proxy temperature record as well. Oh, and life evolved long before a mere 800,000 years ago – if CO2 continued its slow and steady march down (which it would’ve without our intervention) then plant life would surely be on its way to starvation. It is lucky for the planet that we came along and started releasing all that trapped CO2. R Gates says : “…might seem that I am implying that purely by the difference in numbers (1% versus 40%) that the larger percentage must have a greater influence. This is absolutely not my intent…”. I’m happy to take R Gates at face value, ie. by what is actually said – the scientific approach? (it’s not who says it, it’s what they say). It seems to me that in describing the argument as being between a 40% change in CO2 and 1% change in TSI [0.1%? – peter_ga], R Gates has hit one of the nails on the head. We all know that it’s not just a case of seeing which is the bigger number, but of understanding enough of what actually happens on the real planet as opposed to the IPCC’s pretend computer models. In the case of CO2, the IPCC has come up with some large, unsubstantiated and self-serving “feedbacks” in order to make it look more important, yet with TSI, the IPCC dismisses the possibility of any “feedbacks” with a hand-wave. Weather not climate : We are all enjoying (in a technical sense) the cold weather currently hitting so much of the world. It is expected by those who take note of solar and climate cycles, so to that extent it is relevant, but of itself it is only weather. For example, if a dozen places around the world suddenly hit a record high for a few days next week, does it change anything? And yes, I can confirm from personal experience that it can and does snow in some parts of Australia in summer from time to time. Antarctica : The key point IMHO is that Antarctica maintained its sea ice while the Arctic failed to, thus raising a big question about AGW. However, it is quite possible that the AGWers will soon be gleefully switching their attention from the Arctic to Antarctica – see “polar flip-flop” in Svensmark’s Cosmoclimatology page (sorry I don’t have the link here). When it comes to global warming, thinking is so limited to either there is global warming or there isn’t. No one thinks of other factors that contribute. To think that we can deforest the planet and pump massive global amounts of CO2 into the atmosphere and think it has no effect is ludicrous. What you have going on in the UK and much of Europe is a result of global warming and of NATO combating global warming. First, as global warming melts ice in the arctic north, the salinity of the Atlantic Ocean falls, slowing the Gulf Stream that moderate temperatures in Europe. Second, most of the oil from the BP oil volcano in the Gulf remained underwater, reaching the Atlantic Ocean. This has decreased the flow of the Gulf Stream. Third, NATO countries operate chemtrail planes that spray thick lines of particulates in the atmosphere, reflecting sunlight back into space. They are rarely seen in the summer but you can see tic-tac-toe patterns just hanging in the sky on most days in winter, and it only happens in NATO countries. It’s been going on for over 10 years now, which also explains why global temperatures haven’t risen in the past 10 years. It’s a big, secret band aid in the sky that no ones notices or questions, even though they never saw it happening before the late 90’s! You may already have this and I have missed it: Coverage of weather/ climate trends in Southern Africa and South America. You already have good networks in Australia and New Zealand, and Antarctica’s few long term sites aren’t hard to manage. What is needed is a way of getting the whole SH picture. Is this parody or mental illness? Extremes is what’s happening..Like a lifeless desert.. Extreme heat, extreme cold..The balance is slipping..OUR interference is causing or should I say helping extremes..I feel sorry for us..Like a virus slowly killing our life support known as Earth…like a virus unable to stop itself. CO2 has not been this high in at least 800,000 years, and geologically speaking, it has spiked to its current level virtually instantly (..) if you consider that normally it takes tens of thousands of years for CO2 to move the way it has in a few hundred years. So it played zilch part in the massive increases in temperature at the end of each of the glacials in 800,000 years, but regardless of this or that CO2 is shown from all observations to lag c800 behind temperature increases, it is suddenly the main culprit blamed for driving warming in this tiny window of time of a couple of hundred years (even though we are actually in the usual slide of temperature downwards from the high warming which unfroze us in the northern hemisphere and caused sea levels to rise c350′ at the beginning of our present interglacial)? The figure touted by NASA this last year was 600,000 years, but 600kyrs or 800kyrs, how do you explain the end of the 8 or 6 glacials every hundred thousand years when CO2 levels were so much less? How?! If it wasn’t even higher levels of CO2 than we have now, how did such gazumping masses of ice burying the northern hemsiphere in mile high + fridges melt every 100,000 years? I find this disconnect really disconcerting – surely it can only be sold to people who have no knowledge of the enormity of these crucial to life on earth changes? This is a fun page – with permission to download and edit, to educate one’s community climate science…. 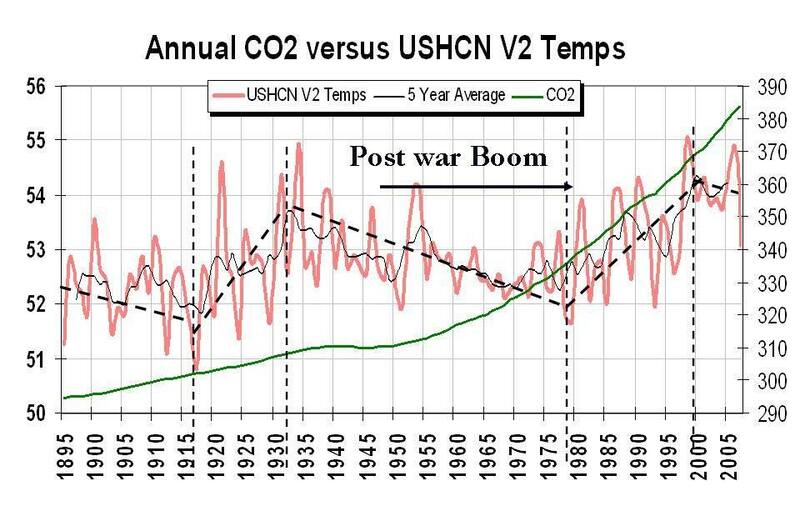 If you take a look at page 44, and bear in mind that there is no explanation that this is the Vostok graph showing a consistent c800 year time lag of CO2 behind temperature rises, what is obvious, is that if CO2 has never been so high over the “last 800,000 years”, then the current CO2 is out of step with historical global climate pattern and still can’t explain the end of glacials and the dramatic beginning of interglacials, and it can’t be having any effect now since a great deal less of it was around during these real dramatic events. Much of which is a lot of unnecessary facts. What’s important now, burrrrrrrrrrrrrrrr, is survival!! Tom and “LT” in Florida are both mistaken. There has been lots of oil and dispersant (corexit) spotted in southern Florida and the east coast. The oil usually shows up after a period of strong westerly winds (it blows across the Keys). It is dispersed at night by unmarked planes and boats. The dispersants have turned our normally clean harbors quite ‘milky’ looking… we can’t even see the bottom in 4 feet of water anymore. It’s been this way since mid summer, but you won’t be hearing any of this in the MSM. Sorry Tom,,, and sorry LT. I wish you were correct, I really do. Brian says, amongst other things : “most of the oil from the BP oil volcano in the Gulf remained underwater, reaching the Atlantic Ocean. This has decreased the flow of the Gulf Stream“. the oil spill was of 4.9 million barrels (I have also seen it reported as nearly 20 million barrels), to which you can add 2 million barrels of dispersant. Let’s call it 20 million barrels in total – but note also that much of this is reported as lying on the bottom of the sea, not flowing out of the Gulf. where “Sv” is Sverdrups. 1 Sverdrup = 1 million cubic metres per second. 20 million barrels in, say, 3 months, is equivalent to about 0.0000012 Sv, or about 0.0000022% of the Gulf Stream. (Please check my arithmetic). I find it hard to believe that it is affecting the flow rate of the Gulf Stream. I find everything else you said equally hard to believe. If you want to be taken seriously, I suggest you put up some solid substantiation of your claims. Footnote : The BP oil spill was a major disaster, in which 11 people were killed and many people’s lives and livelihoods were affected. I most certainly do not want to give any impression that the spill was anything but truly awful. Ice age smice age. Global warming wobbly swarming. Look, homo sapiens has really [/snip] up all of the planet life support systems due to greed, hubris, ignorance, and blatant stupidity. A supposedly ‘intelligent’ species that invents its own means of complete self-immolation defies imagination. I am a builder trying to construct our family home in a tiny village located dead centre of the uk and 1450 ft above sea level. I have worked out side almost continuously for the last 3 years, and as we are unaffected here by city air pollution, have felt the un-blunted force of the weather. We’ve had heat stroke in the spring (when the sun seems most fierce) with 30c, hail in the summer, monsoon rain in the autumn and snow (up to 4ft on the level not drifts) /sub zero temperatures (now regularly in the -teens) lasting months. All the while we are on site in a caravan.So you can understand why I’ve developed and interest in our weather. I’ve always struggled with the notion of a co2 driven climate, mainly because it seems too handy for crooked governments to hit you around the head with while empting your pockets! But I can understand past treads of a Planet with-in a huge cosmic clock where many variations in its surface character are expected. I’m not however getting why one seemingly obvious factor in the Earth’s climate character is not being discussed, Water. If this Planet is to become warmer, which it indeed seems to be trying to do (in my view as a result of its relationship with the sun) more water vapour will be force into the atmosphere where it will dissipate to the the poles where it will have a cooling effect. I would regard the water on this Planet as a shield which has historically saved the Earth from the fierceness of the sun during the procession of the galaxy. This simple view of our universe is not easy to tax, so I’ll expect this post (my first ever!) to be rubbished. Anyway it would seem that all agree change is a foot. And I would not feel compelled to write this unless I was deeply worried that the ‘the powers that be’ may be missing (or worse denying) “unfortunate truth” here. In Norse lore, Odin’s only clue to Ragnarök, is the fimbulvinter. Ragnarök is known as the “destiny of the gods.” Anyone who has researched ancient texts may come to the belief that time is cyclical. This would only be an end of an age in this physical realm. This fimbulvinter is also known as “The Great Winter.” This is 3 successive winters back-to-back with no summer. Is this the beginning of the fimbulvinter? Fast from this world to protect thyself. Man-made global warming is a hoax to further a carbon tax agenda. All of the planets of the solar system are heating up considerably. This is a cyclical event that happens every Platonic year, if not sooner. As well I understand the lie of the 20th century. There are/were far more sustainable forms of energy than what we are/were using. Those who rule’s mantra is out of chaos comes order. Why else would a book, “Petrol, Petrol” be written in German by an occultist in 1903 that depicts the Gulf Oil Spill exactly as it was to happen. The same can be said about Ayn Rand’s “Atlas Shrugged.” This is their playbook. It was written in the late 50’s and it reads like today’s headlines. Could someone near East Anglia, *please* wade through the drifts over to the university there, and take some photos of the Hadley CRU tower covered in snow? You can’t miss it, it’s an ivory coloured tower. Then post them on the net. At some point as the snow gets deeper and deeper, those pictures will seem extremely funny. But hurry, the opportunity for mirth may be fairly brief, if this turns out to be the start of a new glaciation era. Mini or otherwise. I wonder at what depth of snow, will people start calling for AGW/carbon credit trade scammers to be arrested? At what snow depth (or degree of agricultural failure due to ice) will we see Warmists actually dragged from their conferences by hungry shivering mobs intent on some impromptu street bonfires? After all, the name Warmists could sound very suggestive to cold people. Btw, I’m another who thinks that releasing all that long-sequestered carbon into the atmosphere, is probably a very good thing for the biosphere. CO2 increase clearly doesn’t force global temperature, but does greatly increase plant growth vigor. How much extra CO2 will it take to grow forests across the world’s equatorial deserts? Bonus if the world is cooler and wetter. Thomas Globig is skeptical that what is occurring this winter has little to do with Climate Change because he points to the weather of the past. Yet he fails to grasp or even make reference to the fact that in 1950 there were 2.5 billion people on the planet while today, a mere 60 years later, we are racing to an all time record of 7 billion people. Population has almost tripled in 60 years based on burning fossil fuels and there is not the remotest possibility it impacts the weather? What is obvious is that it is too late. The world can’t be saved … by politicians. The window of opportunity for politicians to do something, anything, that would allow them to take credit for the cooler temperatures is now long past. Nature has done it without them. Welcome to WUWT. In thinking that the sun and water are more important to climate than CO2, you will find yourself in good company here I’m sure, but, yes, there may be some who disagree with the precise mechanism you describe. The science may be a bit complex in places, and it would be nice if the politics were simply as you describe it (about your money). Unfortunately, you may have misunderstood the politics. I recommend you read what Vaclav Klaus, President of the Czech Republic, has to say about it. If anyone should recognise totalitarianism, he should. Just search the web for “Vaclav Klaus”, or buy his book Blue Planet in Green Shackles. The clue is in the word “global” – in that crowing about a particular local neck of the woods as being colder this or colder that entirely misses the point ( as does crowing about warmer conditions at the opposite end of the argument BTW ). Assuming you consider the source reputable ( and if it is not then I live in a world I do not recognise ) this illustrates the fact that when we add in the whole globe such overall warmth appears … note the unusual warmth in Canada, the Arctic and most Oceans. It is “local weather” outside the window not “Global climate”. Having said the above, however, I do believe that ( and it should be obvious that there are ) other cycles bearing upon climate, ie the ENSO and Solar cycles. The Solar cycle being most interesting to me. It has been long known that Low solar minima give rise to notably colder northern European winters – this , I believe, is a consequence of an influence on the Stratosphere. A warmer than normal Stratosphere ( or at least a disruption of the main stratospheric vortex from its normal position/shape seems causative. ( I understand from contacts that the UKMO seasonal model – rightly slated a year ago for not predicting last years cold winter – has now been given much greater resolution at stratospheric levels, and in a rerun of conditions now predicts winter 2009/10 as cold ). Whether this is caused by up-welling waves from the troposphere due to AGW or ENSO influences or affects from space ( cosmic rays ) or both is unknown. Maybe instead of selling carbon credits they should market temperature credits. When it gets too cold in Germany maybe Brazil can sell them a few degrees of heat . If these were sold as fancy lithographs they would make great wall hangers and also could be traded like baseball cards. Seriously? It was colder in 2000? Who would have thought? Especially considering that was the middle of the last solar maximum, while we are currently in an extended solar minimum! 1998 and 2005 are the two hottest years ever recorded. Smack in the middle is the last time it was this cold. Karmakaze – before you say it is [snipped language], wouldn’t it be a good idea to check the data? I would be interested to know what you find. BTW, “coldest for 10 years” doesn’t mean it was colder exactly 10 years ago, just that it is colder this year than the previous 9. Tony Banton – “crowing about a particular local neck of the woods as being colder this or colder that entirely misses the point“. Correct. But wrt the NCDC/NOAA temperature anomaly map you posted, it is possible that the data is not quite as reliable as it should be (and for someone who thinks that data overrides theory/models, this is very inconvenient). There has been a lot of discussion on WUWT about inaccurate measurements, urban heat, disappearing thermometer bias, and the impression (fact?) that most warming seems to occur where there are no thermometers. I prefer to use the satellite LT temperatures where possible, as I think they are probably more reliable. RSS are indeed showing 2010 to be the 2nd-warmest in the satellite age to date, but there is a time lag from surface to LT (especially in an El Nino? ), so it would be a good idea to wait a few months before coming to firm conclusions. One last comment : I’m not impressed with a model that “now predicts winter 2009/10 as cold“, or did you mean 2010/11? The reason for our bizarre, violent weather? Read on. My article ” The Gulf Stream Has Stopped” (reviewed & edited by two scientists) is available to read at my website “WWW.THELIBERTYMAN.COM”. I provide verifiable mainstream scientific references to confirm that the Gulf Stream has, in fact, stopped. Do your homework. Convince yourself that this is real. Can’t find actual temps for the Isles of Scilly during the days we’ve had record low temperatures and snow, it did affect Cornwall for some days I recall seeing on TV news.